Colorful Flowers Tea set -- Personalized Little Girl's Tea Set Handpainted. . . Announcement Welcome to my shop! Hand-painted Tea Sets, Tea Cups & More! See more photos on Instagram @hollyslayhandmade or https://www.instagram.com/hollyslayhandmade/ Feel free to convo me if you have any questions or special requests! Welcome to my shop! Hand-painted Tea Sets, Tea Cups & More! See more photos on Instagram @hollyslayhandmade or https://www.instagram.com/hollyslayhandmade/ Feel free to convo me if you have any questions or special requests! 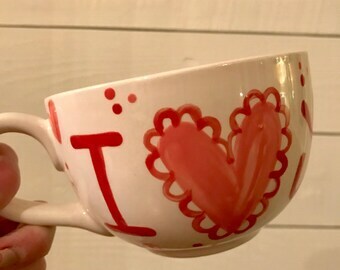 Tea Party Favors // Personalized Tea Cups Handpainted.. . . Happy Colorful Flowers . . Lovely for tea parties and showers. . .
Sweetest creations! Ordered additional pieces to a previously purchased tea set, and they could not be cuter! They were securely wrapped and shipped very fast. So happy with my purchase. Holly is so wonderful to work with and I know I will return for additional purchases! ADORABLE PAINTING! I have bought many! 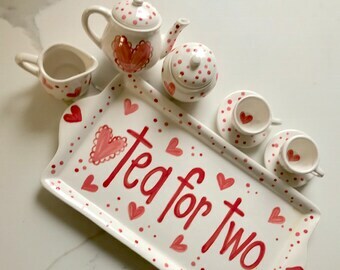 Whimsical hand painted tea sets and more! all my tea sets are hand poured into molds, dried, kiln fired for 24 hours into bisque, then carefully hand-painted in your custom design, glazed in a 2-step process, then fired again for 24 hours -- and finally packed and shipped off to you! Are the tea cups handmade? all my tea cups and tea sets are hand poured into molds, dried, kiln fired for 24 hours into bisque, then carefully hand-painted in your custom design, glazed in a 2-step process, then fired again for 24 hours -- and finally packed and shipped off to you! Yes! I love custom and personalized orders! 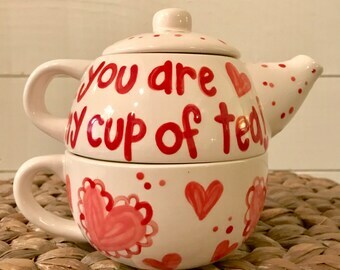 I can match your party theme, colors, invitation, etc, and add a name or phrase to the tea pot and tea cups. . . Please convo me and we can discuss a special order created just for you! The adult (large) teapot holds 48 oz and measures approximately 9" across (not including handle). The adult (large) tea cups are 4" across the top (not including handle) and hold 8 ounces. The matching saucer is 6" across. For sizes of other items in my shop, send me a convo and I'll be happy to send you measurements. I pack all my orders in lots of (mostly recycled) packing materials and bubble wrap for safe arrival. I do add pretty tissue paper and a note. Due to the way I pack them for safe arrival, I can't gift wrap them, however I'm happy to include pretty tissue paper and a gift card! All my items are fired in my kiln using food-safe, non-toxic and lead-free paints and glazes. They are dishwasher safe, although I do recommend hand washing the tea cups and saucers due to their delicate nature. All my items are very labor intensive, due to their totally handmade nature, so I'm not able to offer wholesale prices. However I do offer great discounts -- convo me and we can work together on a price!